Money magazine runs a poll every year of the best places to live. They break the country down in to three regions, then break each region into populations over 100,000, and under 100,000. I’m pleased to see that our current home town of Flower Mound was ranked #1 in the state of Texas, and #2 in the entire western region in the under-100,000 category! Our town beat out local heavyweight Coppell, who came in at #15 in the entire western region. Kudos also go to Plano, which ranked #1 in the western region over-100,000 category, as well as the city of my employer, Richardson, which hit the western region list at #12. There’s been a lot of talk about how USC is the “people’s choice” for college football’s national championship. Mostly, this talk has come from sports pundits who think the glitzy Trojans are all that and a bag of potato chips, to quote a bad Mike Myers movie. So what did the people think? Well, let’s go to the Nielsen ratings for the week of December 29, 2003, through January 4, 2004, courtesy of EW, shall we? The Sugar Bowl, featuring the LSU National Champions and those Oklahoma Sooners, was the #2 rated show of the week, with 23.9 million viewers, second only to the Cowboys-Panthers NFL playoff game. The Rose Bowl, featuring USC and the Michigan Wolverines? Didn’t even register in the Top 30 shows viewed. The Orange Bowl clocked in at #8. The Fiesta Bowl came in at #9. More people watched the lame Michael Jackson special than watched the Rose Bowl. Face it, USC-worshipping sports writers: the people have spoken, and their choice for college football’s national championship makes its home in Baton Rouge. Geaux Tigers! …are department stores sending when the lingerie section is located right next to the baby/toddler/children’s department? Jason who for the Heisman? Thanks to my sweetie for passing this on. 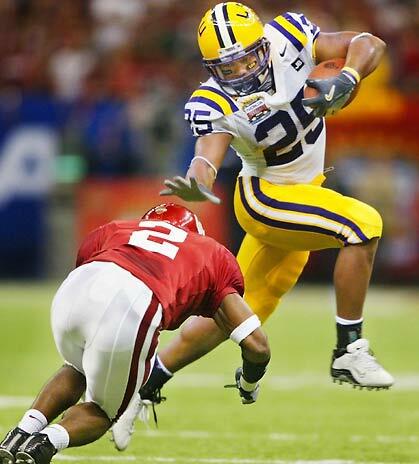 It’s taken 45 years, but LSU sits atop the ranks of college football’s elite. The cliche is that defense wins championships, and that was no truer than tonight’s Sugar Bowl, and LSU’s 21-14 victory over Oklahoma. The #1 defense in the country rose to the challenge and dominated Oklahoma for most of the game, putting up 14 of LSU’s 21 points, off of Sooner turnovers. Oklahoma is to be commended for not giving up, for making the Tigers earn the title. LSU looked a little gassed in the 4th quarter, but they dug down and played their guts out to secure the win. Having grown up in Baton Rouge from the time I was five, I didn’t have any professional sports teams to look to. For me, and thousands of other kids, LSU football, and later basketball and baseball, was where it was, and still is, at. That is one of the central reasons why I prefer collegiate sports over professional (hockey being the notable exception, but even there, the college game is great). I was going to LSU football games before I ever became a student at LSU. As a member of the Boy Scouts, we served as ushers at the football games. Then to go to LSU for four years, being a part of that great tradition as a member of the honor guard presenting the colors at each game, and to see that it has finally culminated in a national championship for our school, and our state, is just a tremendous rush. A USC-LSU matchup would have been nice; it was certainly the one I would have preferred, even if the outcome for LSU was different. But I can live with a co-championship, and the Trojans and the Tigers can live with it, too. The BCS needs to get its act together, since its formation was to prevent this kind of thing from happening. That doesn’t take anything away from the best Tiger football team in over four decades, and the 2003 NCAA College Football Champions. Aren’t principles wonderful to have? They make you feel so warm and fuzzy when you decide to break them. I spent a goodly part of the day today at the local Honda dealership. That was breaking principle #1 right there: setting foot on the lot of a Japanese car-maker. I’ve always been a buy-American sort of fellow, or at the very least, a buy-from-anyone-except-the-Japanese. I have a lot of problems with the way Japan reciprocates—or fails to reciprocate, as it were—when it comes to trading with the U.S. Our products certainly don’t get the same fair shake over there that their products enjoy here. I take heart in that I am holding to a higher principle: buy the best you can afford in any given situation. I have a Swiss timepiece on my wrist. No, it’s not a Rolex, but Swiss watches are the best. I’ve had it for years, I wear it 99.5% of the time that I wear a watch, and I’ll likely have it for years to come. I own SIG handguns. Sure, they’re a little more expensive than a Glock, Smith & Wesson, or Colt, but I’d put them up against anyone else out of the box as the best combat pistols available. And I own a Macintosh, the best personal computer available. Buy the best of what you can afford in any given category. So the wife decided that it was time to stop sinking our money into repairs on her current automobile, and move on. The subject of a minivan was broached. Once the subject was taken seriously, our investigation revealed that the Odyssey was our choice if we were to go that route. And so we went. We’ll take delivery of our Sage Brush Pearl minivan in a couple of days. I, of course, will chalk this all up to my defenses being down due to my current illness brought on by the season’s weather. At least I can say it’s a Dallas Stars green, eh, SuperToad? According to John Saunders and the ABC Sports crew during Fiesta Bowl coverage, no other team in college football history has had the kind of rise through the polls that LSU has experienced this year. The undisputed #2 team in the country, the Tigers started the season ranked at #12. Win or lose tomorrow night, I believe that Nick Saban has finally brought national recognition to a college football program long deserving of notice. Well, USC certainly showed why they deserve to be in New Orleans instead of Oklahoma, trouncing Michigan in the Rose Bowl, 28-14. So now there will be a split national championship, something the vaunted BCS was supposed to prevent. Whether the Tigers win or lose tomorrow night, I really wanted there to be an undisputed national champ. The Trojans of USC will, of course, pronounce themselves as such, no matter the outcome of the Sugar Bowl. This is when LSU head coach Nick Saban’s “bowls plus one” plan would be a reasonable alternative to a defined playoff system. In the event of a “tie,” as there will be at the conclusion of the Sugar Bowl, those two teams play one more game for all the marbles. I doubt Return of the Digitalpembroke would make a very good movie, but here it is. In an effort to further reduce the personal clutter in a weblog devoted to Macs and technology, further discussion of LSU athletics (Geaux Tigers! ), the Stars, movies, books, music, etc., will be confined to this space. Digitalpembroke was my first weblog, named after, somewhat, our first dog, Linus, a Pembroke Welsh Corgi. After his death, and in the face of the seemingly insurmountable Retrophisch™ moniker bestowed by a dear friend, further blogging was moved to Retrophisch. Last month, that site was broken down into four different sites, each reflecting my interest in that particular area. When my Google AdSense application was rejected because Retrophisch.com was “too personal/a chat site,” (chat site?!?!? ), I decided to resurrect digitalpembroke.com as my site for all things personal, and we’ll try again with Google AdSense in a few months. I’m still in the process of moving over photo albums, reading lists, etc. from Retrophisch.com. I will also re-link to the photo albums originally hosted here that never made the transfer in the first place. The old archives are online, and accessible via the link list in the side bar. I currently have no plans to go back and retool them to reflect the site’s new design.